The third son of the Duke and Duchess of Palma, nine-year-old Miguel Urdangarín, will receive tomorrow the First Communion in the gardens of La Zarzuela Palace. I hope there will be some photos of the event for us to see. I'm wondering who will be present at Don Miguels First Holy Communion. It would be nice to have a new Royal family photo,its quite rare we get to see them all together. I hope the King's sisters are invited. I don't think they were present at the other communions, but those were with the rest of their school classmates and probably had restricted guests. Any number of pictures would be great. It would be wonderful to see the whole family together! its today. so when we are going to see the first pictures of the whole family together? I just did a search but didn't find any photo's just articles in Spanish on the First Holy Communion . Agree, it would be great if we get a picture or two. Don`t expect more, because it seems like a private event - it is in Zarzuela, not at a public church. I haven't found pictures yet but according to the articles the whole royal family attended. The King's sisters, infante Carlos and Princess Alexia of Greece with her husband were also present. There are more family members and many from the Urdangarín family, as well as friends of Miguel from his Barcelona school with their parents. 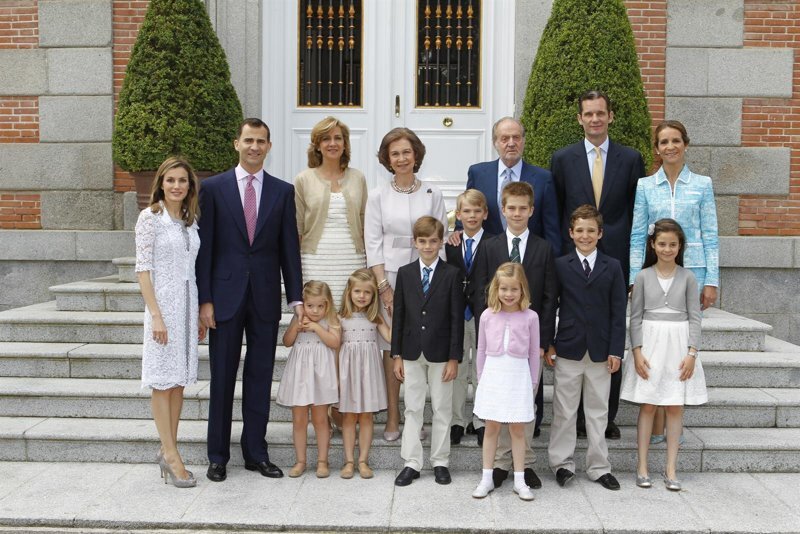 Other guests included members of the King's household and staff of the infantas and the Urdangarín Borbón family. The communion took place in the garden of Zarzuela, in front of the chapel. After the ceremony a photo session took place, followed by a snack and lunch for the guests. I wonder if Princess Irene was present? I'm also hoping the Palace release a few photo's of Don Miguel & the Royal Family. what a pity!!! ive been looking forward it even before it was announced, and i was already espectulating that will be this year. sadly no photos! I believe this is one! 2 ?s and a comment! Can we have the link in English please, LadyFinn? In the photos, where is Miguel? HM. The King looks horribly frail, old, and ill.
as always they all are looking great, but must say Victoria in particular. She really is looking like a lady here and a smile too :)! Thanks for all the photos. It´s great to see the whole family and Miguel is soooo handsome!All the children look great as a matter of fact. You´re right, Mia mae, Victoria is developing more and more ibto a very pretty little lady! Wow, the pictures are wonderful. The group photo of the whole big family is one of the best SRF pics. Just one big lovely family Everyone looked great and the children - well, they cannot be prettier, all of them.